Проекты деревянных домов компании "Карпаты-Дом"
Wood was always considered to be a great material for the house building. The projects of the wooden houses and the proper technology of the building process – is a guarantee of longevity of the wooden construction. 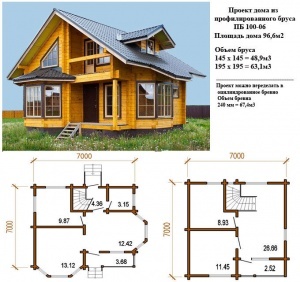 Every year the demand of the wooden houses building increases in Ukraine. The company “Karpaty-Dom” uses modern technologies and pays attention to the quality of the materials during the process of the inner works. Our knowledge gives us possibility to speak about a high position in the market. We have a great archive of the unique projects which were created by our experts. The photos of the wooden houses may be found in our web-site . There are many houses of different size and price. -the primary plan. The location of the rooms, their size and metrics. Walls, windows, and doorways. – the roof of the house. Its size and the location of the windows and pipes. -cutaway of the house inside and out. The specificity of the window opening and the doorways. The log houses projects may include the planning of the basement and its size ( if you wish).If you don’t have the already done basement we will help you with this task! Our high qualified specialists will manage it in short terms. After the basement is ready 21 days should pass before work starts. The log wooden houses will be built for you by qualified specialists. You can see the wooden constructions done by us all over Ukraine. We have many orders from abroad where people appreciate quality, professionalism and environmentally friendliness. We will take into account your taste and the peculiarities of your land plot. Why do the consumers star to pay attention to the wooden construction building? First of all it is on an easy-to-pay basis. There are many factors which influence positively on the price of the wooden houses. The wooden house is much easier that the one from brick or concrete. The basement can be done not only on the solid ground. It saves your money. The building is performed in short terms and the purchaser can move into the new house in a few months. Such house has thermal insulation and will serve you and your family for many years. We will create a unique project of the wooden house, taking into account your budget. Live with harmony in your new house which has been built by our company!